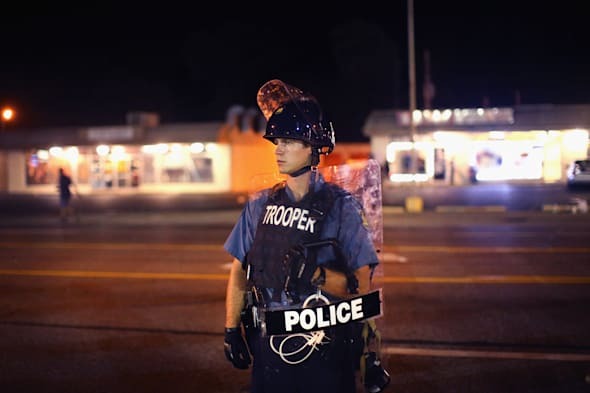 NEW YORK (AP) -- What if Michael Brown's last moments had been recorded? The fatal police shooting of the unarmed black 18-year-old in Ferguson, Missouri, is prompting calls for more officers to wear so-called body cameras, simple, lapel-mounted gadgets that capture video footage of law enforcement's interactions with the public. Proponents say the devices add a new level of accountability to police work. "This is a technology that has a very real potential to serve as a check and balance on police power," says Jay Stanley, senior policy analyst at the American Civil Liberties Union. The case supporters make is simple: Cops and criminal suspects alike are less likely to misbehave if they know they're being recorded. And there's some evidence supporting it. In a recent Cambridge University study, the police department in Rialto, California - a city of about 100,000- saw an 89 percent decline in the number of complaints against officers in a yearlong trial using the cameras. The number of times the police used force against suspects also declined. After the trial, the cameras became mandatory for the department's roughly 100 officers. Rialto isn't unique. Across the U.S. and in England, Australia, Brazil and elsewhere, a growing number of departments are implementing the cameras, in addition to - or instead of - the dashboard-mounted cameras that are already widely used in police cars. Some one in six U.S. police departments now use body cameras in some form, according to ACLU attorney Scott Greenwood. The Los Angeles Police Department is testing the cameras and the New York City Police Department said this month that the department is exploring the feasibility of using the devices. The city's public advocate, Letitia James, has called for the cameras as a check on police misconduct following the death of a black man placed in a chokehold by a white police officer last month in Staten Island. Cameras come with complications, however. It's unclear whether a police body camera would have altered the situation. A bystander recorded Eric Garner shouting "I can't breathe!" as police officer Daniel Pantaleo placed him in a chokehold. Garner later died. The city medical examiner ruled the death a homicide and the Staten Island District Attorney said this week that the case is going to a grand jury. Although body cameras provide a record that courts and police can use to reconstruct events, there's no guarantee the footage will provide easy answers. There are privacy concerns for all those being recorded, whether it's the police officers, crime suspects, victims or innocent bystanders. There are also legal and procedural questions: Who gets access to the recordings? And what happens when an officer's device mysteriously malfunctions or gets turned off at an inopportune moment? Experts including the ACLU's Stanley caution that with the gadgets must also come with well-thought-out policies, including guidelines that spell out how long recordings are kept and what to do in situations where footage goes missing. "We live in a time when most people's reaction to any problem is `clearly, if we have an app or some sort of a digital device, that will solve the problem,'" says Neil Richards, professor of law at Washington University in St. Louis. Richards says the notion that body cameras might solve problems of police misconduct is "naive." "The problem is that we can't fix deep-seated social problems with a $10 gadget or with a million-dollar tank," he says. The body cameras currently used in police work vary. They include devices that can be worn as glasses, including Google Glass, the company's $1,500 Internet-connected eyewear. But more common are the small, rectangular lapel cameras that attach to an officer's uniform and record audio and video with the touch of a button. Taser International Inc., which says it is the largest provider of body-mounted cameras to U.S. law enforcement agencies, has seen sales of its wearable cameras increase sharply in the past year. Bookings for sales of the cameras, which cost $400 to $700 each, grew from between $1 million to $2 million in early 2013 to $11.4 million in the April-June period, says Taser CEO Rick Smith. Taser's cameras are constantly recording, but the footage is deleted every 30 seconds unless an officer presses record. In that case, the 30 seconds before the officer hit record are kept in addition to everything else that's subsequently captured. The recordings are stored on Taser's Evidence.com online service. Smith says the site is to the cameras what iTunes is to iPods. "It's not the hardware that's difficult, it's how you manage the data coming out of all these devices," he says. Brian Smith, a former police officer who is now assistant professor at the University of New Haven in Connecticut, expects that eventually every police department will use the cameras. He compares them to the now-common dashboard cameras used in police cars, which had their own supporters and skeptics when they were first introduced. "Officers went from being suspicious of them, worried that they would get caught doing something - not terribly wrong - but (something like talking about their bosses)," Smith says. But he says they started to come around after seeing that the recordings could help prove false claims against them wrong. "And also on the flip side, if we did have a few officers, bad apples, that did engage in misconduct, they were being recorded on camera," Smith says.